Imagine the following: Israel declares its intention to create a buffer zone between itself and the Gaza Strip. The rationale is trenchant. 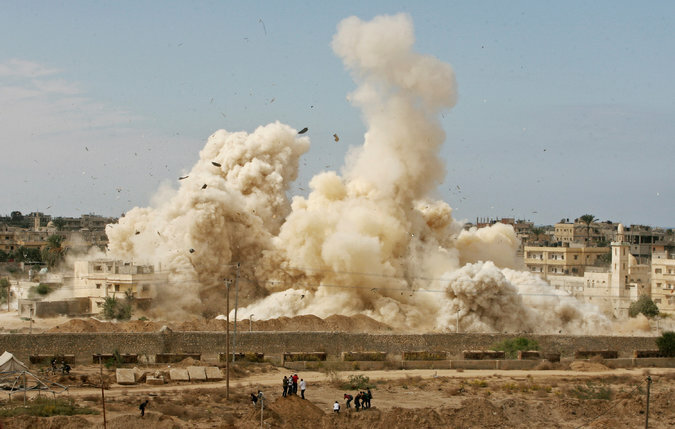 After the discovery of numerous attack tunnels leading from Gaza into Israeli communities – to say nothing of ambushes, attempted abductions and mortar fire – Israel resolved to clear a swathe of territory from any habitation. This would deny the terrorists cover for their tunnel-digging, ambushes, etc. It’s no stretch to suppose that immediately upon Israel’s announcement of intentions, the entire international community would explode into a deafening recriminatory uproar. Condemnations and threats would flow in from around the globe. The UN would censure, the US would threaten and the EU would preach. If Israel would proceed with its plans despite the pandemonium, a horrific terror spate would erupt, rockets would rain on Israeli civilians, Israel would be ostracized, sanctions would ensue and a maelstrom of malevolence would engulf the Jewish state. Footage of hapless families evicted with all their worldly belongings and of their homes being blown sky-high would seal Israel’s fate as the pariah of the civilized world. Gaza’s sins would go unmentioned. Not all of the above scenario is make-believe. A buffer is being created, families are evicted with all their worldly belongings, their homes being blown sky-high and the rubble is bulldozed. A deep canal is mooted along the demarcation line as is a tall concrete separation wall. The only thing that keeps this from outraging world opinion is the identity of the side provoked into this action. It is Egypt and not Israel. The border is between Gaza and Egypt rather than the Gaza-Israel border. These distinctions alone suffice to make it all not much of a big deal. If Jewish/Israeli culprits can’t be fingered it’s apparently of no consequence. Such is sadly the mindset abroad. That said, Egypt deserves no worldwide rebuke. It knows, as do foreign governments and the media, that Gaza is the terrorist nerve center not only against Israel but that its fanatic reach extends elsewhere. The gangs of firebrand jihadists who roam through Sinai often penetrate via Gaza or are manipulated from there. The same goes for the military-grade weaponry which these Islamist extremist openly deploy. Gaza’s hub of sedition and insurrection not only affects Israel. The many Egyptian casualties, the bombed oil pipelines, the rampant sabotage, the kidnapping of tourists and much more have led Cairo to recognize that no modus vivendi with the current Gazan powers-that-be is feasible. Gaza’s Hamas warlords had enjoyed a honeymoon phase while the Muslim Brotherhood (of which Hamas is an offshoot) ruled Egypt. But Cairo’s patience has ended with the recent slaying of over 30 of its troops. The Egyptian public appears to give its government wide latitude, the expelled residents of Rafah know not to tangle with Arab forces (which are hardly as soft-hearted as Israelis), journalists have been barred from the scenes of destruction and the Arab world hasn’t yet resorted to the shrill hysteria that would doubtless by unleashed against Israel for far less. But it would be naïve to suppose that Israel would escape with no flak. In popular Arab commentary – even inside Egypt – Israel is described as somehow being behind the Egyptian operation, as having advised and even directed the Egyptians regarding the measures they should adopt. Israeli experts, according to these prevalent spins, have instructed Egypt on the minutiae of anti-terrorist tactics. There’s no denying Egypt’s current offensive does benefit Israel. The Sinai could have been a dangerous new front that Israel can’t afford. It’s further a relief to Israel that gunrunning and bankrolling funnels via Sinai might be minimized. Surely Egypt is doing what cannot be avoided. This is Gaza’s comeuppance. Nonetheless, none of this is undertaken for the love of Israel. Egypt has its own very compelling complaints against Gazan provocations and aggression. In a way, this can be viewed as Egypt’s disengagement from Gaza. Ironically, however, in its own 2005 disengagement Israel harmed no Gazan interests and had expelled its own population. This has since been repaid with violent ingratitude. Well done Sarah! If it just stops the flow of money it would be amazing!!! Oh, but Sarah, I just heard the Egypt condemned new construction in Jerusalem. Who do those lousy hounds think the are?? The Gaza terror entity is a threat for ALL of it’s neighbours. Of course, the US, EU and UN have no problems with Egyptian self-defence, contrary to Israels self-defence. THIS IS ANTISEMITISM, PLAIN AND SIMPLE. And Obama & Kerry are still dreaming of making Judea and Samaria a super Gaza…let’s hope and pray for the elections now under way, to FINALLY make them IRRELEVANT !